'Just an update. I saw the new pulmo. doc and was very impressed. My pft's yesterday revealed a restrictive process that he felt was compatible with the neuromuscular disease. My dlco remains low. He's not sure why as he said that it doesn't necessarily fit in with the myopathy. He also was concerned with the high ANA and repeated that yesterday along with some other labs. He reviewed the ct chest and he noticed the enlarged lt atrium on the ct.When I go back to see him,he is going to repeat some more specific neuromuscular pft's.I told him what my cardiologist has said about not treating until the ef was < 30%. He did not feel comfortable with that as he felt that was too low to wait for treatment.Thank you for this great site. My mother has bullous emphysema. i want to know how safe it is for her to fly commercial from tennessee to australia where i live for a visit. she was recently told that she might not be able to fly by a nurse. are there any special precautions she can take or things to do in this circumstance? I would really like to get her here for an extended visit if possible as she has not seen her youngest grandson yet. We are back from ATS and will start posting new cases. This is a 60 y/o woman with a significant previous TOB Hx with very little on the way of symptoms. She had some cough and a CxR revealed a small nodule on the R. The CT scan below actually revealed two nodules, one on each side (see below, they are both fairly small). How concerned would you be and how would you work her up? As we celebrate the first anniversary of this blog we are all packing for the ATS International Meeting. We will resume postings next week. In the mean time we will be presenting a poster on the use of this format of pulmonary case discussion on Sunday at ATS. Stop by and visit (Sunday morning, Thematic Poster Session, [A110]). Lung Ca (particularly adenos) can be receptor positice (I have seen a few references of over 25% positivity). 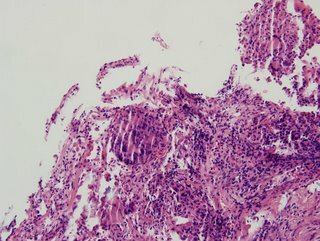 Have you encountered a lot of these ER/PR+ lung Cas and does it have an impact on Tx? Have you seen many endobronchial mets without parenchymal mets from other sites such as breast? Fondaparinux was better than Enoxaparin for DVT prevention after knee surgery in a NEJM study. For medical patients, though, have you been using much fondaparinux for DVT prophylaxis or is a LMWH still your default? 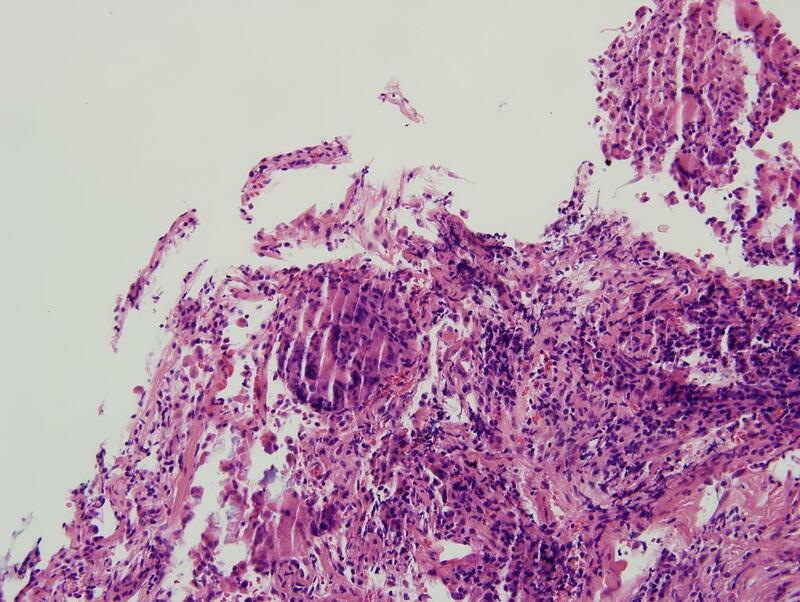 showed chronic and granulomatous inflammation, with focal active lung injury. I had posted this case on two previous posts. This is a 55 y/o remote smoker with a persistent cough who had an abnormal endoBBx (squamous cell Ca) despite a normal CT scan of the chest and a negative PET scan. She had had breast Ca some five yeras ago with mastectomy, chemo/xRt and had some myocardial damage due to the adriamycin. Many good suggestions were made to the role of inflammation in false-positive biopsies. I sent her to the chair of CT surgery at a nearby large university hospital and he was equally puzzled. While we were debating what to do, she developed new CHF, had a cath, PTCA, PM placed and and AICD. She has ischemic cardiomyopathy and was quite unstable to consider surgery right then and there. She was medically treated for her heart disease, stabilized and reassessed. Unfortunatelly, despite a negative PET three months before, on a repeat CT then PET she now had adenopathy and two small PET+ spinal mets... She was sent to oncologyand though the endoBBx looked like a squam it was poorly differentiated. The oncologist requested staining for estrogen and progesterone receptos because of the Hx of breats Ca and those were positive. A couple interesting questions came up. Lung Ca (particularly adenos) can be receptor positice (I have seen a few references of over 25% positivity). With the receptor positivity would you automatically assume this is a breast Ca? 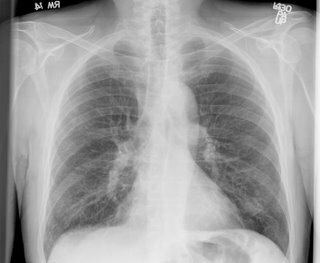 Have you encountered a lot of these ER/PR+ lung Cas and does it have an impact on Tx? 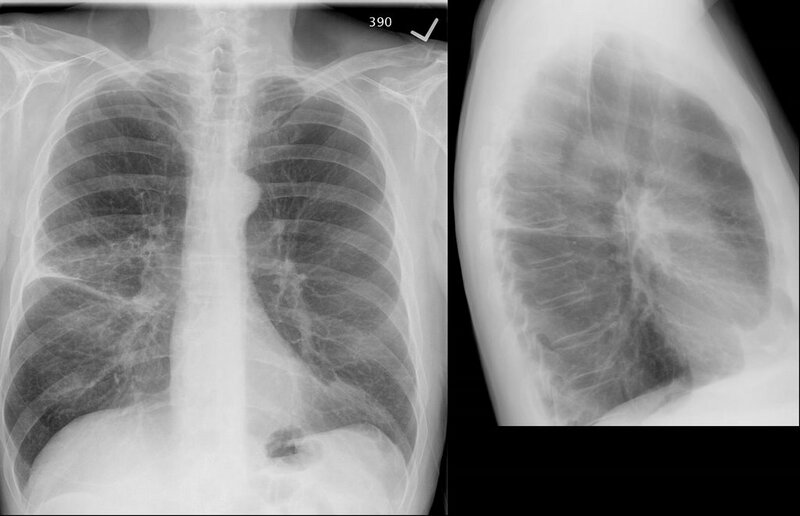 If we regard that as a true late met of breast Ca, have you seen many endobronchial mets as in this case? 71 year old with mild COPD reports progressive dyspnea over the last 2-3 months. He has been treated for his COPD with an Atrovent and an Advair inhaler. He says that his symptoms were relatively well controlled with these medications until recently when his shortness of breath became progressively worse. No cough, fever chills or diaphoresis. Mild weight loss with relative anorexia. He has arthritis and has multiple complaints of joint pains. 5. Osteoarthritis - What helps is etodolac 400 mg BID and soaking feet in hot tub. 35 to 40 years. Lives in a house which is new. He used to live in an apartment a few months ago with no problems there. Spirometry: FEV1/FVC 68.5 (93%), FEV1 2.85 L (94%)FVC 4.16 L (101%)DLCO 54% predicted. CPK normal 104, Sed. rate 15, ANA weakly positive, rheumatoid factor negative. He has had normal SPE, aldolase, cortisol, urinalysis, lytes-7 profile, liver profile, TSH, CBC. Cervical spine x-ray showed advanced degenerative changes. X-rays of the hands have shown osteoarthritis mainly at the first carpometacarpal joints. Lumbosacral spine x-ray showed degenerative changes. 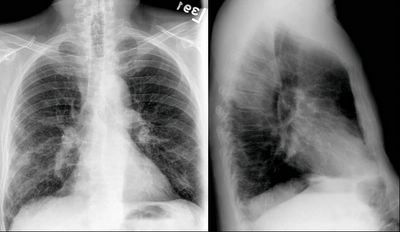 Over the course of his progressive dyspnea he had some xray changes. What would you do next, or what thoughts do you have regarding the DDx? A patient was just diagnosed with lung cancer and will be undergoing surgery soon. 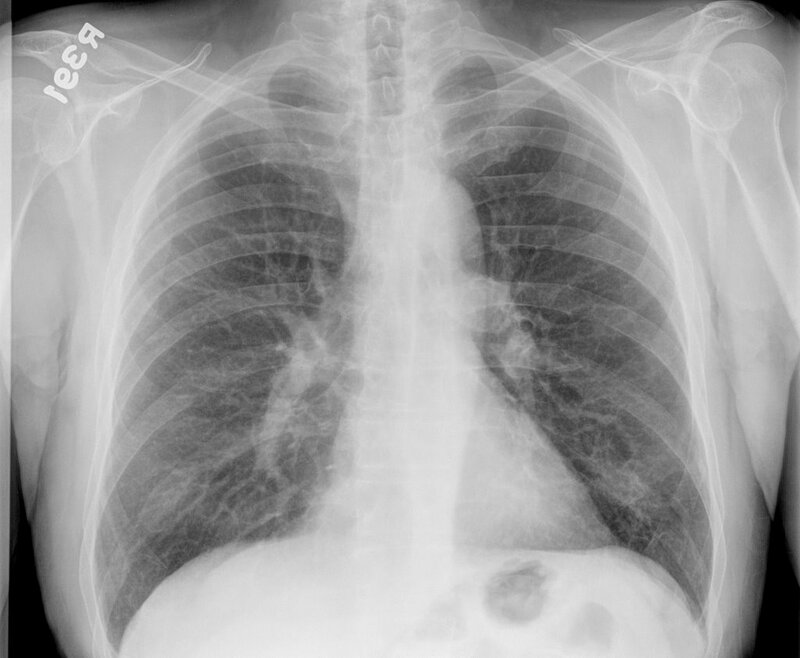 The tumor was discovered during an incidental Cxray and is approx 2.5 cm and located in the right lower lobe. We were encouraged to find that the ct scan showed no spread to the the lymph nodes and no pleural effusion. However, a subsequent PET scan showed bilateral Hilar uptake but no mediastinal uptake. The Thoracic surgeon scheduled a medianoscopy before the lobectomy just to make sure there was no spread of the cancer to the lymph nodes. His feeling is that the PET scan would have shown some mediastinal uptake on the PET scan and feels that the bilateral Hilar uptake is probably not cancer. Just wanted to get some other views on this situation. How are each of you utilizing the TBNA (Wang needle) in making the diagnosis of sarcoidosis? Stage I only? Stage II only? What sized TBNA needle are you using? How many passes do you make with the needle (presuming you do not have cytology at the bedside? A patient of mine has RA-ILD and is on methotrexate. She will be on it for at least 3 months (or longer if it works). Do you prophylax for PCP with Bactrim in this case? 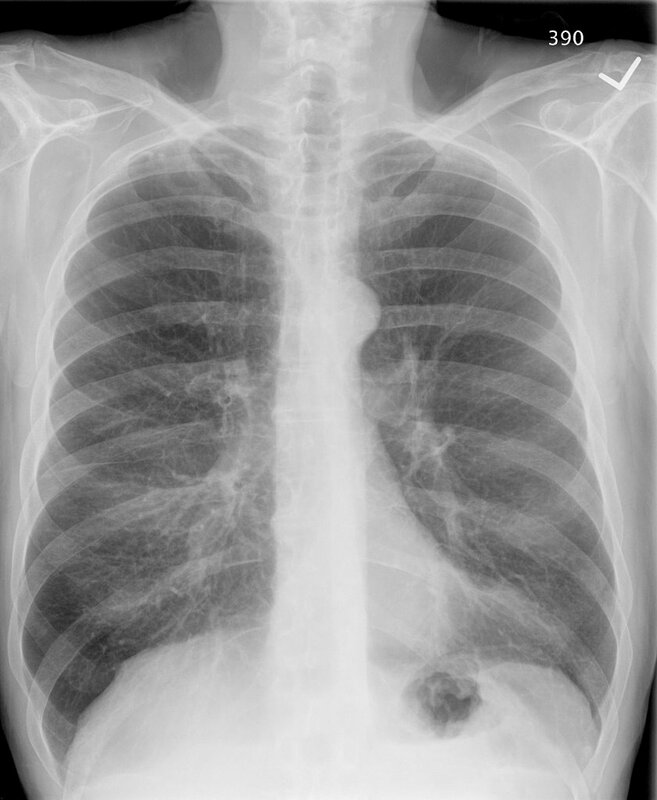 I have recently seen this 75 y/o woman with significant obesity for persistent hypoxemia. She has no TOB Hx and not a lot of structural lung Dz. Her PFTs were remarkable for a pettern consistent with obesity. I thought alveolar hypoventilation might account for much of her hypoxemia and obatined an ABG. Her mid-day ABG revealed normal pH, paCO2 of 57 and a low paO2. Because of the hypoventilation, obesity and history of loud snoring I thought she might also have OSA. However, her sleep study showed nocturnal hypoxemia but no OSA. Have you seen many cases of OHV without OSA or structural lung disease? Would you start her on BiPAP? If so would you try and get a titration study even though she does not meet OSA criteria? Otherwise how would you choose her settings? An outside question, posed here for any comments. Doug/Jeff H: maybe Fernando can address? I am a41 yr old female dx'd with a probable mitochondrial myopathy. My muscle bx showed increased lipid drops. An EMG showed a myopathic trend. Testing for MG was negative. My pft's revealed fev1 77% of predicted, fev1/fvc 74%. Diffusing capacity at 69% of predicted- last one was 68%--DL/CO/VA of 5.45. MVV was 31% of predicted and negative inspiratory force was -10. HRCT showed minimal bilateral basilar scarring vs interstitial changes. Echo showed left atrial enlargement,decreased lt ventricular systolic function,trace mitral and aortic regurgitation, ef of 45% (was >55% in 1999). DO you think the decreased diffusion should be followed upon or is it because of the neuromuscular disease process going on? My pulmo said I have mild asthma but the muscle weakness is a bigger problem. Any suggestions would be appreciated. We're selling our house, and the radon test came back at 3 pCi/L. The buyer suggested he wanted money to mitigate this level and we told him he could hold his breath for free. Thought it would be interesting to get some discussion on radon and lung cancer risk. Why did the EPA choose 4 pCi/L as their action level? Is it reasonable to mitigate for a level of 3? I thought this was a good article to start with: Darby S. BMJ. 2005 Jan 29;330(7485):223. Also, does anyone have any good articles on perception of risk or communicating risk? "Associated Press - SANFORD, Fla. - A jury awarded $28 million Wednesday to a woman who sued her gynecologist for allegedly botching an operation that left her unable to urinate naturally." "NORWALK, FL -- Norwalk Hospital, a former doctor and his practice have agreed to pay nearly $17 million to settle a lawsuit filed on behalf of a woman left in a vegetative state after giving birth." Association and its then-President, William L. Frame." (from AAPSOnline). Malpractice coverage and asset protection is becoming a bigger and bigger deal for physicians. What is the current status in your state? Is there a cap on "emotional suffering" damages? How friendly (or unfriendly) is your state towards physicians? What's the best way to diagnose exercise-induced asthma in a patient where the history seems to fit and baseline spiro is negative: methacholine challenge or post-exercise spirometries? 72 year opld with severe COPD developed right sided pleuritic chest pain. No fever chills or increased shortness of breath. What would you say is the definitive pulmonary textbook that should be in your bookcase? Case updates can be found in the comments. The 47 year old man with bilateral adenopathy who presented with hypercalcemia. The 38 year old woman with seizures and multiple pulmonary nodules is still an unknown, so any additional comments would be appreciated.